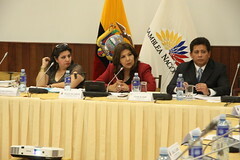 The National Assembly (Spanish: Asamblea Nacional) is the legislative branch of the government of Ecuador that replaced the National Congress in 2009, under the 2008 Constitution. The National Assembly has the power to pass laws, while appointment of judges to the National Court of Justice is done by a separate Judicial Council. Its flag is white with its emblem placed in the center of the flag. The emblem itself is parliamentary chamber formed a flower. Its colours are those of national ones. National Assembly's Spanish name is placed under the flower with black letters.